We are more than just a cleaning product supplier. Customer satisfaction is at the very core of everything we do. Not only do we offer top quality cleaning products at competitive prices, but we also work closely with all of our distributors to establish mutual success. If you supply the professional or domestic cleaning market and are interested in becoming a Ramon approved distributor then please feel free to contact us and request an application form. We have been manufacturing dishcloths in the UK since 1951 and mops since 1992. We are proud of our British manufacturing heritage and where possible we will support other UK manufacturers, with the majority of our range produced on these shores. As BRC accredited members, customers can be assured that our products meet all consumer expectations surrounding quality, safety and operational criteria. Our committed sales team are always on hand and willing to go the extra mile. Ensuring that we provide as much value to our customers as possible to help them succeed. We are specialists in providing private label products in a variety of formats. Our in-house design team able to create custom designed artwork to suit your business requirements. Our experienced sales team and staff are always happy to assist our distributors with any inquiry. Carriage is paid on all orders above £300 in value. As the only UK distributor of TTS professional cleaning systems we can offer high quality bespoke cleaning solutions. We have a large network of approved distributors across the UK. As a result if you’re an end user then we can put you in touch with your local distributor. Our committed and experienced sales team are happy to provide product training to all our customers. Thereupon increasing knowledge and aiding sales. We are able to assist our customers with a variety of marketing support. From the production of own label packaging to bespoke promotional flyers we are here to help. Our warehousing facility enables us to hold large amounts of stock ready to be shipped on request. Consequently this makes us an ideal one stop shop for the janitorial distributor. As a proud UK manufacturer of cotton based cloths and mops you can be assured of consistent, quality products. As the sole distributor of TTS products in the UK we can offer a large range of premium quality trolleys. In addition our distributors can custom build any trolley so it will meet the exact requirements of their customers. The trolleys offer complete flexibility in design thanks to the unique modular system. They can be designed to incorporate lockable drawers, lids or doors. Not only does this provides safety and security but equally this provides use all of the available space for storage. The trolleys offer hygienic separation between waste and storage which as a result help’s prevent possible cross contamination. Manufactured from high grade polypropylene. 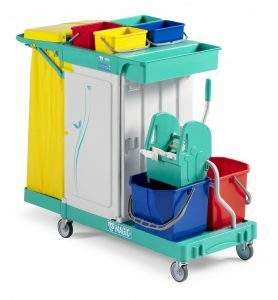 The trolleys are extremely durable and have smooth surfaces, therefore this enables them to be kept clean and hygienic. They are also fully recyclable. Available with standard, outdoor or silent wheels, the trolleys are light and consequently very easy to manoeuvre.